Figure 1: Bullous lesions on the finger extending to the elbow. Systemic lupus erythematosus (SLE) is a heterogeneous disease associated with multiple acute or chronic cutaneous manifestations, including the relatively rare category of bullous lupus. The development of vesiculo-bullous lesions may be associated with a high morbidity, hence they warrant an urgent investigation, including a skin biopsy to identify the diagnosis and initiate prompt treatment. With this case, we are going to describe the occurrence of progressive bullous skin lesions in the absence of fever and leukocytosis in a patient with known SLE and discoid lupus on immunosuppressive therapy. This case highlights the importance of considering a broad differential diagnosis as the treatment can be vastly different. Staphylococcal scalded skin syndrome is caused by an exotoxin released by the Staphylococcal bacteria. It attacks the desmosomes, causing detachment of the epidermal layer. 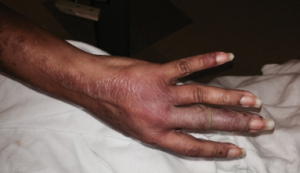 A 46-year-old African-American woman was diagnosed with SLE and discoid lupus in 1999. She was being treated with hydroxychloroquine 400 mg, prednisone 35 mg, mycophenolate mofetil 1,000 mg and cyclosporine 100 mg daily at the time of presentation. She had previously been unresponsive to rituximab and belimumab. Given the severity and the extent of her skin lesions, she was started on pulse-dose intravenous steroids. She had responded well to this therapy in the past. High-dose steroids led to resolution of some lesions, but within a few days, new lesions appeared, involving her limbs, abdomen and thighs (see Figure 1), with morph­ological evolvement of the rash to form painful desquamating bullous lesions filled with serous fluid. The malar rash did involve the naso-labial fold (see Figures 2a, 2b). Nikolsky’s sign was positive. There was also purulent discharge from both eyes, with inflammation of the iris, and bullous lesions were visible on the external ear. Importantly, there was the notable absence of oropharyngeal or vaginal mucosal involvement. Figures 2a and 2b: Vesiculo-bullous lesions on the face and neck after the patient received steroids on admission.